Day Trade The World™ is proud to announce the release of the new M-ELO (Midpoint Extended Life Order) on the Nasdaq, NYSE, and AMEX markets Friday, April 13, 2018! M-ELO is a non-displayed order type that is priced at the midpoint between the NBBO. M-ELOs will not be eligible to execute until a minimum half second holding period has been met. M-ELO orders can only interact with other M-ELO orders, which have also met the holding period requirement. The voluntary resting time prior to a match eliminates the ability for market participants to access the M-ELO book just as the market is transitioning to a new price. This protects M-ELO traders from negative price impact as the market moves, thus addressing market impact concerns. The incorporation of a minimum resting time on a M-ELO order protects traders from rapid market movements and adverse selection. M-ELO provides a mechanism where traders can send orders seeking to minimize market impact. M-ELO Statistics Nasdaq has seen strong growth week over week not only in volume, but also in symbols active/traded, quote stability, and notional. The following table shows quote stability as a percentage where the quote remains static 1 second following an execution in M-ELO. We have seen this grow to 80%, which, when taking volume/symbol growth into account, highlights the fact that MELO provides protection against book clearing orders while maintaining minimal market impact. M-ELO activity between March 12 and April 6, 2018. All figures are daily averages. The following table shows M-ELO's volume growth over time. 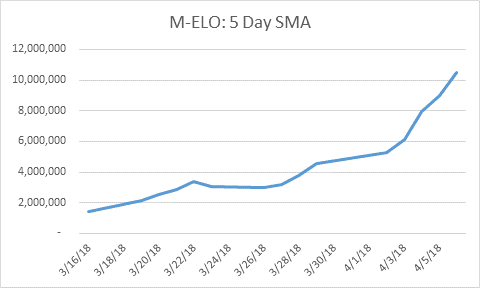 Five-day Simple Moving Average of M-ELO executed volume between March 16 and April 5, 2018. Limited-Time Promotion M-ELO order execution will be FREE for DTTW™ traders until Thursday, May 31, 2018. Remember to tell your traders about this brand-new order type—and trade using M-ELO on the US markets! For more information, please see the official Nasdaq webpage.